European leaders have criticized the Trump administration’s approach to a Middle East peace plan, arguing that the current U.S. government had abandoned international norms. In an open letter written to The Guardian on Sunday, a group of nearly 40 former high-ranking European leaders, including Sweden’s former Prime Minister Carl Bildt, Germany’s former foreign minister Sigmar Gabriel, the U.K.’s former Foreign Secretary David Miliband, and Belgium’s former Prime Minister Guy Verhofstadt, argued that Europe must continue to support a two-state solution for Israel and Palestine regardless of what the Trump administration’s Middle East peace plan looks like. “Unfortunately, the current U.S. administration has departed from longstanding US policy and distanced itself from established international legal norms,” the letter reads. “It has so far recognized only one side’s claims to Jerusalem and demonstrated a disturbing indifference to Israeli settlement expansion. The U.S. has suspended funding for the U.N. agency for Palestinian refugees (UNRWA) and for other programs benefiting Palestinians—gambling with the security and stability of various countries located at Europe’s doorstep,” it continued. “Against this unfortunate absence of a clear-cut commitment to the vision of two states, the Trump administration has declared itself close to finalizing and presenting a new plan for Israeli-Palestinian peace. Despite uncertainty as to if and when the plan will be released, it is crucial for Europe to be vigilant and act strategically,” the European leaders added. The European leaders argued that a Middle East peace plan should include a separate state for the Palestinians based on the borders that existed before the third Arab-Israeli war was fought in 1967. 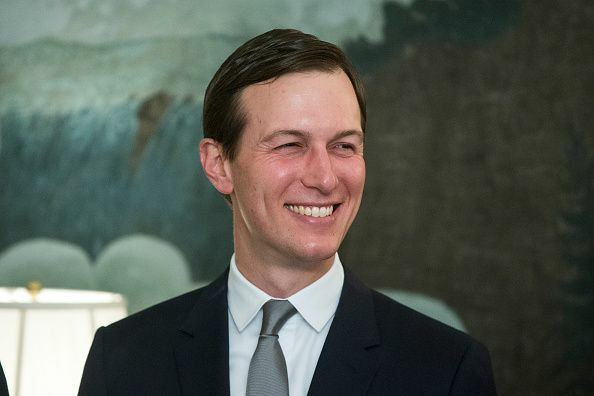 President Donald Trump’s son-in-law and adviser, Jared Kushner, has been placed in charge of delivering a Middle East peace plan and has been visiting with Arab leaders across the region to discuss his proposal, the details of which are not yet public. Reports have suggested that Kushner’s peace plan does not envision a separate state for the Palestinians. Palestinian leaders have refused to engage in the process because they do not view the Trump administration as an honest broker in the negotiations with Israel. Since coming to office, Trump has demonstrated staunch support for Israeli Prime Minister Benjamin Netanyahu’s government and recently recognized Israel’s claim over the Golan Heights, which Israel seized from Syria in the 1967 war. The U.S. also moved its Israeli Embassy from Tel Aviv to Jerusalem, a move that was viewed by many as recognition of Israel’s de facto control over the city despite the fact that its eastern half has long been envisioned as the future capital of a Palestinian state by those who favor a two-state solution. Meanwhile, Netanyahu shifted further to the right in the lead up to recent elections and even pledged to annex parts of the West Bank once he began a new term as prime minister. The comments have received no criticism from the White House. Sunday’s letter was signed by 25 former foreign ministers, six former prime ministers, and two former NATO secretary generals. The leaders came from the U.K., France, Sweden, Poland, Romania, Belgium, Italy, Denmark, Austria, Germany, Slovakia, Spain, Luxembourg, Croatia, Ireland, the Netherlands, Finland, Slovenia and the Czech Republic.